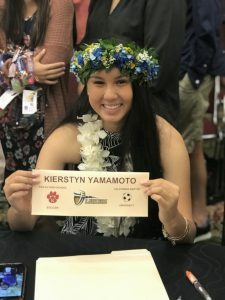 Six female student athletes from Hawai‘i Island high schools will take their love of soccer to the college level. 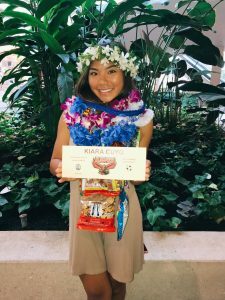 All members of the Hawai‘i Island chapter of Surf Soccer Club, the students include: Jordyn Pacheco, Kiara Cuyo, Sayde Bacdad, Emalia Higgins, Kierstyn Yamamoto and Kaila Ambrosio. They will graduate in 2019. On Nov, 14, the students attended the Hawai‘i National Letter of Intent (NLI) Signing Day at the Hawai‘i Convention Center to express their intent to join teams at four-year institutions. 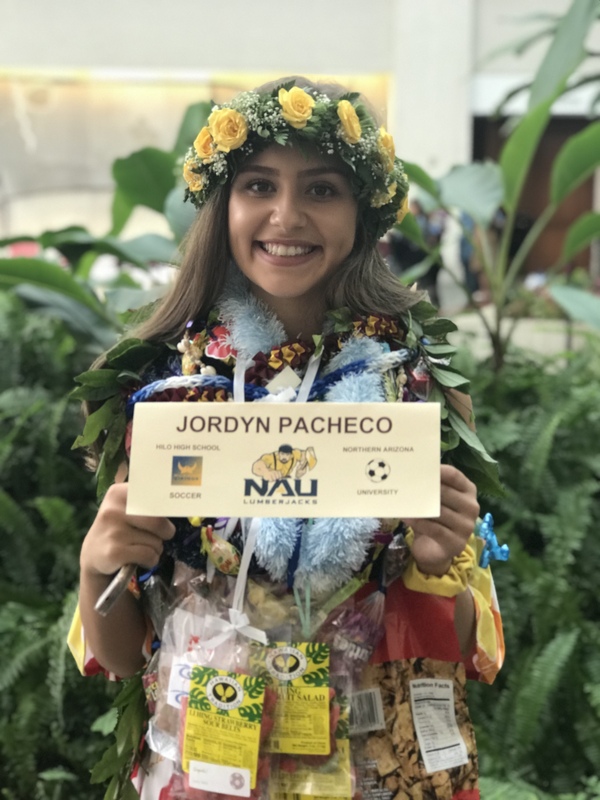 Jordyn Pacheco is a senior at Hilo High School and has been with Surf SC since the 8th grade. A veteran of many Surf Cups, she and her 2001 team were finalists at the 2018 Surf Cup in the prestigious Super Black division. She has signed to Northern Arizona University (NAU Lumberjacks), Division I.
Kiara Cuyo is a senior at Kamehameha Schools Hawai‘i – Campus. She too has been with Surf SC since her 8th grade year and is a veteran of many a Surf Cup and Vegas Showcases. Cuyo has signed to Holy Names University (HNU Hawks) Division II. Sayde Bacdad is a recent addition to Surf SC, officially joining in the spring of 2017. 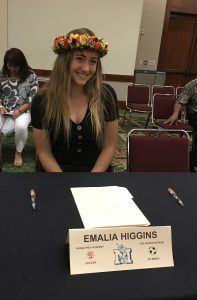 Described as a “fierce competitor with a joyful personality,” she was a finalist at the 2018 Surf Cup and has signed with Utah Valley University (UVU Wolverines) Division I.
Emalia “Emi” Higgins is a senior at Hawai‘i Preparatory Academy and has been a member of Surf SC since the fall of 2016. She was one of two Oc16 impact players at the 2017-2018 HHSAA Division II girls soccer finals. She has signed with Colorado School of Mines (CSMU Orediggers) Division II. Kierstyn Yamamoto is currently a senior at Kea‘au High School. A member of Surf SC since Spring 2017, she was part of the 2001 team that made finals at the most recent Surf Cup. 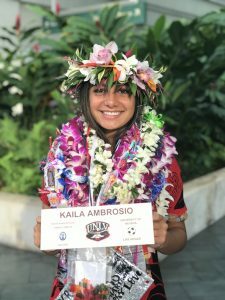 She has signed with Cal Baptist University (CBU Lancers) Division I.
Kaila Ambrosio is a senior at Kamehameha Schools – Hawai‘i Campus. 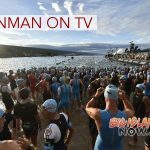 She has been a part of Surf SC since 2012 and has a notable list of accolades to her name: HYSA State Champion, Big Island HYSA champion, a BIIF girls Division II soccer champion, and winner of multiple USCS State championships. 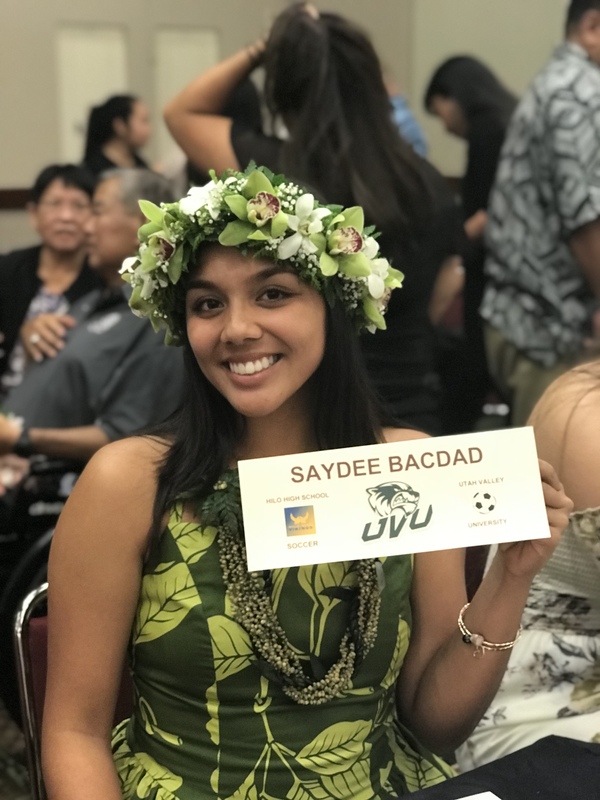 She also represented Hawai‘i twice at the ODP level and is a veteran player at Surf Cups, showcases and tournaments across the country. She is credited with the launch of Surf SC on Hawai‘i Island, and she has signed with the University of Nevada Las Vegas (UNLV Rebels) Division I. The Hawai‘i Island students were among a total of 20 high school athletes from around the state who participated in the signing event.